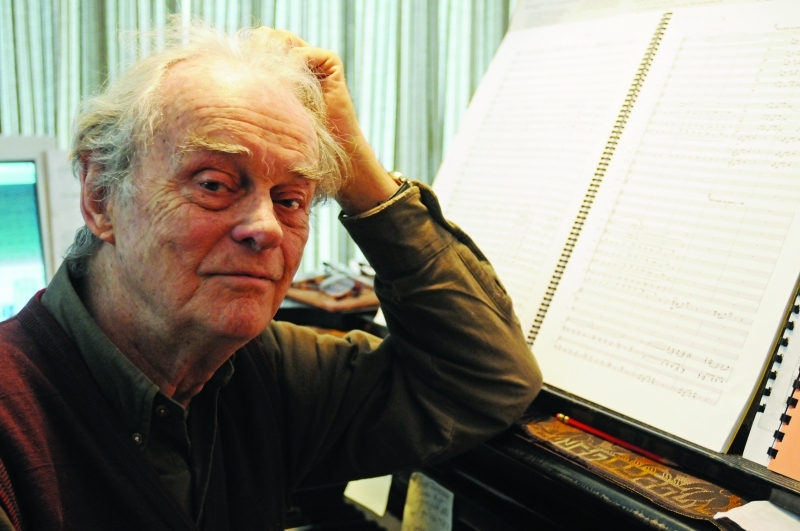 Here at the Sybaritic Singer, we are mourning the passing of composer Lee Hoiby. We bring you this statement from his publishers. It is with the deepest sadness that we report the death of composer Lee Hoiby, one of the greatest masters of opera and song of our time. Mr. Hoiby died on March 28, 2011 at Montefiore Hospital in New York City, following a short illness. Lee Hoiby’s gift for musical fantasy was a constant throughout a long life of boundless creative output. His rich catalog of works encompasses operas, oratorios, choral works, concerti, chamber works, song cycles, and more than 100 songs, many of them championed by such singers as Leontyne Price, Frederica von Stade, and Marilyn Horne, among many others. Hoiby’s commitment to tonality remained steadfast throughout his compositional life, even when such an allegiance was considered unfashionable. His music uniquely combines joyous melodic invention with structural rigor and it was in the seclusion of the Catskill mountain countryside where he made his home that he found the peaceful balance of art and life he so cherished. Lee Hoiby, born in Madison, Wisconsin on February 17, 1926, was one of America’s most prominent composers of works for the lyric stage. He was introduced to opera by his teacher at the Curtis Institute of Music, Gian Carlo Menotti, who involved him closely in the famed Broadway productions of The Consul and The Saint of Bleecker Street. Hoiby’s first opera, The Scarf, a chamber opera in one-act, was recognized by Time Magazine and the Italian press as the hit of the first Spoleto (Italy) Festival. His next opera, Natalia Petrovna (New York City Opera), now known in its revised version as A Month in the Country, was universally praised by the press at its premiere, the closing octet called a work “of overwhelming beauty, a supreme moment in opera comparable to the Meistersinger quintet and theRosenkavalier trio.” Hoiby’s setting of Tennessee Williams’ Summer and Smoke (with libretto by Lanford Wilson) was declared “the finest American opera to date” following its world premiere. The 40th anniversary of the debut of this landmark American opera was celebrated with a new production at the Manhattan School of Music in December, 2010, which Mr. Hoiby attended. Hoiby recently completed what would become his last opera, a setting of Shakespeare’s Romeo and Juliet, with a libretto adapted from the Shakespeare play by Mark Shulgasser. Romeo and Juliet awaits its world premiere. A pianistic child prodigy, Hoiby’s earliest influences included several powerful musical personalities representing numerous strains of the 20th-century avant-garde. Among them was the renowned Pro Arte Quartet, led by Rudolf Kolisch, Arnold Schoenberg’s son-in-law. Ironically, they pierced Hoiby not with their dodecaphonic fervor, but with their echt central-European musical traditions. During the period immediately following WW II, he also performed in Harry Partch’s Dadaist ensembles, studied with Darius Milhaud at Mills College and pursued a virtuoso career as a concert pianist under the tutelage of Gunnar Johansen and Egon Petri. Among Mr. Hoiby’s operatic works are the one-act opera buffa Something New for the Zoo (1979), the musical monologue The Italian Lesson (1981, text by Ruth Draper) which was produced off-Broadway in 1989 with Jean Stapleton, and a one-act chamber opera, This Is the Rill Speaking (1992, text by Lanford Wilson, adapted by Shulgasser). Hoiby was a long-time collaborator with Brooklyn’s American Opera Projects, having held a chair as Mentor Composer on AOP’s Composer and the Voice program for two seasons. In 2006, AOP commissioned a setting of Thomas Hardy’s poem The Darkling Thrushas part of the multi-media opera production Darkling. AOP also co-produced the first professional and orchestrated performances of This Is the Rill Speaking in April of 2008 at SUNY Purchase and at New York City’s Symphony Space, led by conductor Benton Hess and directed by Ned Canty. Hoiby’s contribution to the art song repertoire (over 100 songs) is recognized by singers worldwide. The great American soprano Leontyne Price introduced many of his best known songs and arias to the public. His musical idiom displayed a grateful acceptance of the rich legacy of melodic homophony, embracing references from Monteverdi to American blues without sounding eclectic or piecemeal. “What I learned from Schubert,” Hoiby commented “came from a long, deep and loving exposure to his songs. A lot happens on a subconscious level, so it’s hard to verbalize, but what I think his songs taught me have to do primarily with the line, the phrasing, the tessitura, the accentuations of speech, the careful consideration of vowels, the breathing required, and an extremely economical use of accompaniment material, often the same figure going through the whole song.” Hoiby’s choral music is widely performed throughout North America and in England including such works as the Christmas cantata A Hymn of the Nativity (text by Richard Crashaw), the oratorio Galileo Galilei (libretto by Barrie Stavis), and a substantial group of works for chorus and orchestra on texts of Walt Whitman. Hoiby’s music can be heard on virtually every major record label. The Manhattan School of Music Opera Theater revived Hoiby’s opera A Month in the Country and recorded it for Albany Records in 2005 and their recent recording of Summer and Smoke will be released later this year, also on Albany. In 2009, Naxos released an album of the composer’s art songs entitled A Pocket of Time. Among the many distinguished artists and organizations that have commissioned him are New York City Opera, the Spoleto Festival, Santa Fe Chamber Music Festival, American Opera Projects, The Washington Cathedral, Choral Arts Society of Washington, The Verdehr Trio, the Dorian Wind Quintet, the Ames Piano Quartet, Phyllis Bryn-Julson, the Richard Tucker Foundation, Yale University Institute of Sacred Music, American Guild of Organists, Mercersburg College, and Cantus. Lee Hoiby’s works have been recognized by awards and grants from the Guggenheim Foundation, the National Institute of Arts and Letters, the Ford Foundation, the Fulbright Commission and the National Endowment for the Arts. Recent works by Lee Hoiby include Jacob’s Ladder, for mixed chorus, organ and brass quintet, composed for the re-dedication of the Cathedral of St. John the Divine in Manhattan in 2008; Last Letter Home, Hoiby’s 2007 musical setting of Pfc. Jesse Givens’ note home to his family before perishing in Iraq which very quickly became one of the most performed contemporary choral works with versions for men’s chorus, SATB chorus with string orchestra, piano or string quartet, and for solo baritone and piano; And The Waters Flow, for mixed chorus, children’s chorus, bass, harp and organ; and The Christmas Tree, a rapturous holiday offering available in versions for SATB chorus a cappella and with orchestra. A consortia of university and professional opera companies is currently in formation for the world premiere run of Hoiby’s opera Romeo and Juliet in the 2012/13 season. Lee Hoiby is survived by his partner and longtime collaborator Mark Shulgasser. In lieu of flowers, donations may be made to the American Virtuosi Foundation, Inc. for the support of the Lee Hoiby Institute for American Music. Please visit www.leehoibyinstitute.org for further information which will be active after March 29. A memorial service at the Cathedral of St. John the Divine will be held on a date to be announced later this spring.